TK-4 features a newly developed woven elastic textile band (3” wide by 40” long) that provides incredible strength and flexibility. 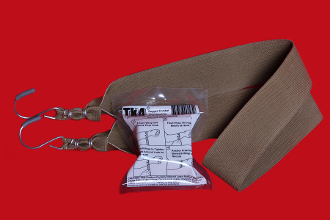 With one steel hook fastened steadfast (three thick hog rings per S-Hook) to both ends of the elastic band, and packaged in a small, vacuum-sealed pouch, TK-4 is the perfect solution for any kind of injury involving arterial bleeding. TK-4 has been deployed by the US Marine Corps, US Special Forces, and numerous law enforcement and emergency services.